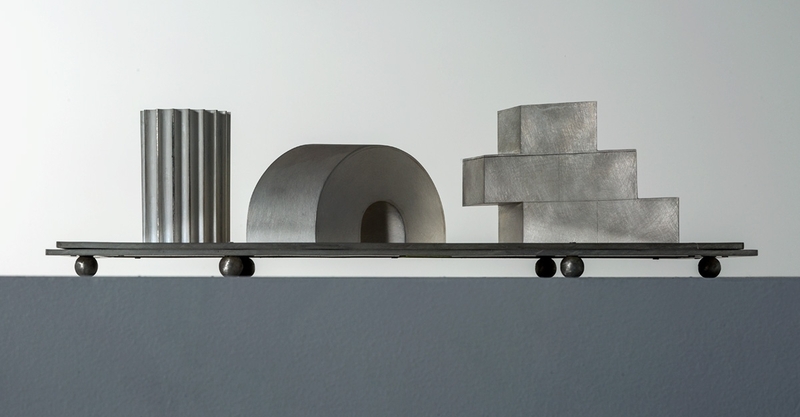 The sweet landscapes of the Veneto Region, where Giampaolo Babetto trained and is based, have been particularly evocative for the conception of these pieces, authentic sculptures in silver: oscillating between Babetto’s famous trompe l’oeil motifs and flat patterns, these precious elements are the result of a long and painstaking manual work, necessary to give to each object not only a perfect shape (obtained thanks to a continuous, powerful yet delicate hammering), but also that special aura, or patina, which makes it profoundly meaningful and singular. A special finishing, extremely time-consuming, has been chosen to convey an even stronger allure. Real architectural structures brought into a domestic environment, the elements of this condiment set are true jewels for the table.